This vegetarian sheet pan stuffing recipe is sponsored by the Cherry Marketing Institute, a continued partner of Heartbeet Kitchen. I love spending an entire day in the kitchen. Making a recipe that has upwards of ten steps and a slew of ingredients is something I enjoy. A challenge, which I struggle to find in other areas as I get older. BUT I feel equally triumphant (if not more), when I’m able to make something more efficiently without comprising taste or texture. A sort of kitchen prowess, fist bump kind of feat. like. Especially when I’m cooking for a lot of people, or have several dishes to make. Welcome to the holidays, right? 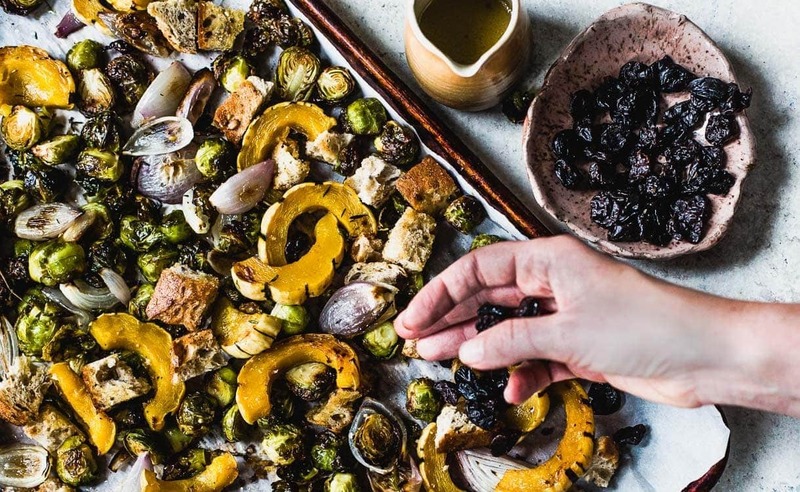 And this plant powered recipe specifically fits in as the side dish for a cherry-centric menu that a few friends have created for a Friendsgiving dinner. 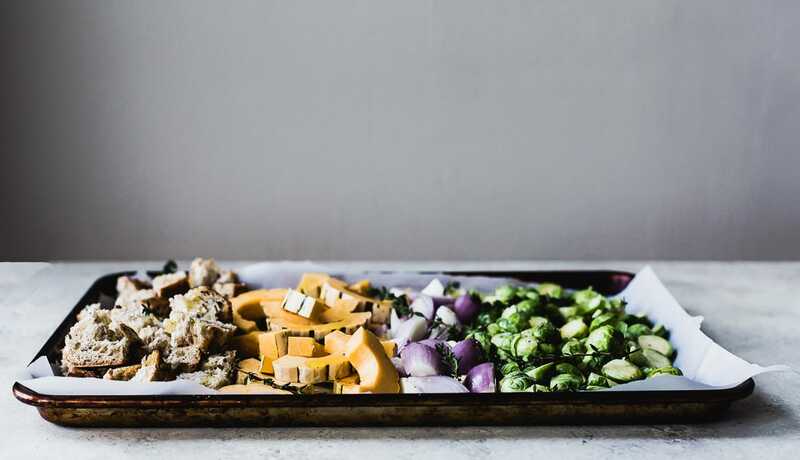 Take stuffing for example, which would traditionally create a mountain of dishes, double the time, and three times the effort of this vegetarian sheet-pan version. 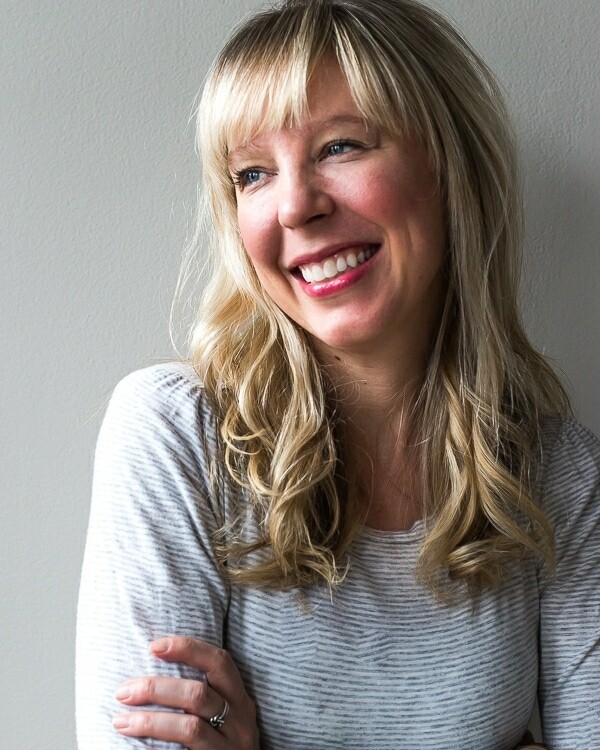 And this one includes my absolute favorite fall ingredients. 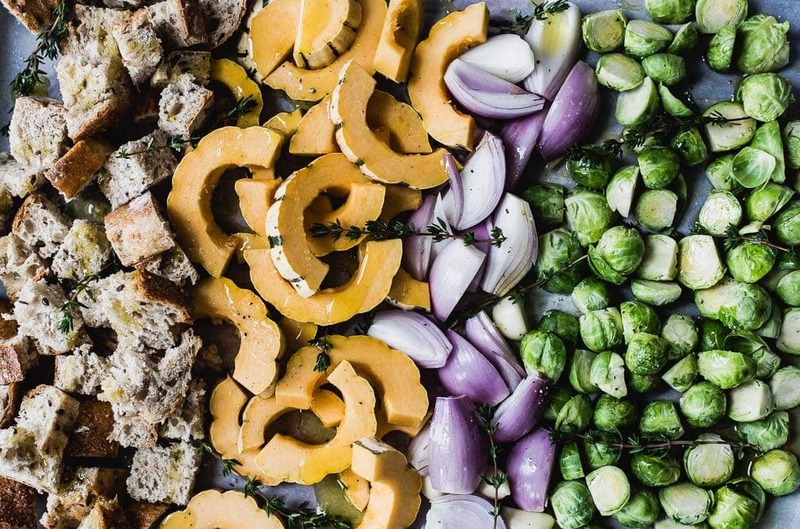 Highly customizable, I choose to nestle in sprigs of thyme, garlic, and shallots alongside the seedy bread, squash, and sprouts. I firmly believe that the sheet pan is your number-one ally to making a lot of miracle meals, a true workhorse. 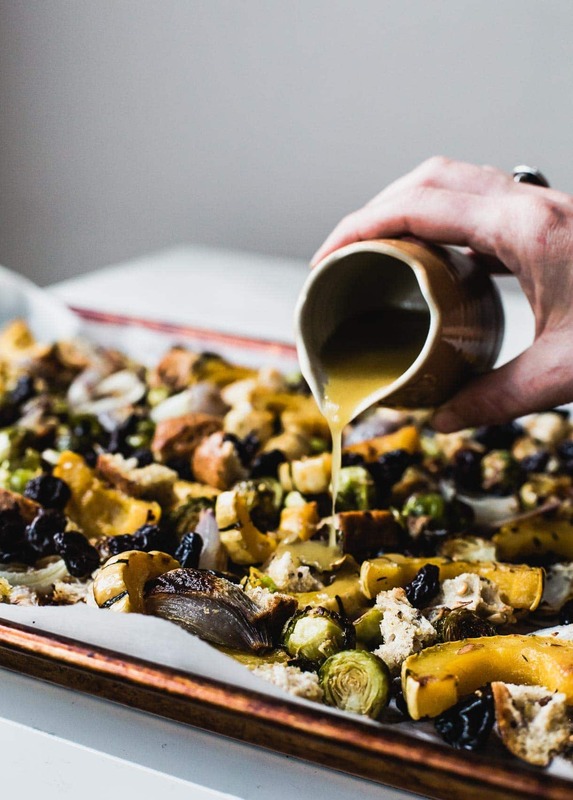 Baking stuffing on a sheet pan ensures a high ratio of crispy edges, in contrast to what I find often too “custardy” with traditional recipes. I kept the bread cubes on the end of one pan, and removed after 8 minutes, just as they were golden brown. Everything else caramelizes for about 30 minutes, and when finished, dried tart cherries are stirred in. They’re the secret to each bite, a bit of sweetness, a bit of tart. Montmorency tart cherries are a U.S.-grown fruit sourced from small family orchards. That means choosing Montmorency tart cherries can help support local agriculture and preserve generations-old families. host of health benefits. And they support many important health benefits, including sleep, inflammation, heart health and exercise recovery. To ensure there’s moisture throughout, I mixed up a quick maple vinaigrette, which balances the savory, toasted notes and gives the bread a little something to soak up. And it repurposes the garlic cloves that roasted in the stuffing, blending them with the other vinaigrette ingredients. You can make this with regular bread, or a gluten-free variety. And while I wasn’t going for it, this is a vegan stuffing. I’m guessing any of your carnivore friends won’t miss a thing. In fact, I can guarantee they’ll want to know where they can buy delicata squash. With its nutty, sweet corn flavor and an edible skin, it’s my absolute favorite winter variety. 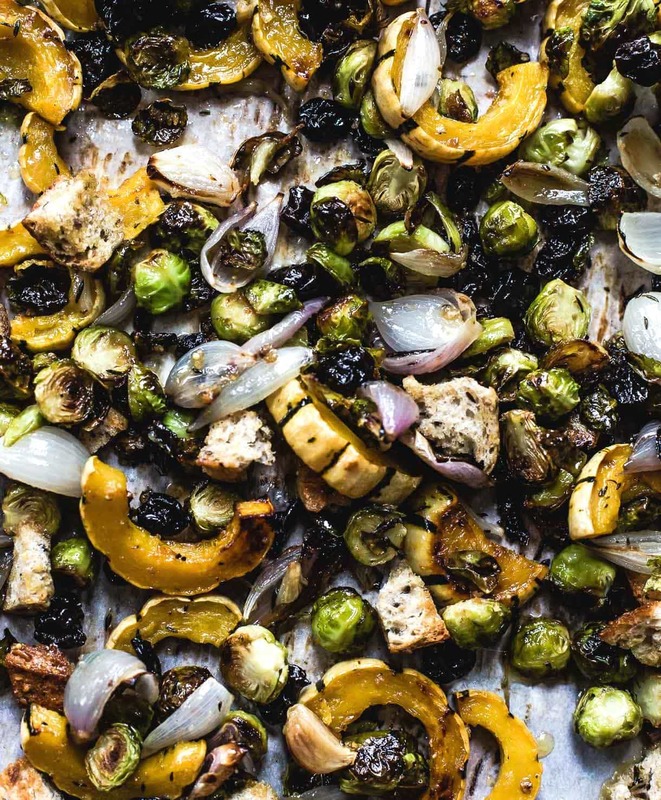 Combine all vegetables on one pan and add toasted bread and tart cherries. Pour vinaigrette over stuffing and stir. Serve warm. I’m all in for the high ratio of crispy edges and only a few dishes to deal with – please and thank you! This is gorgeous , Amanda. 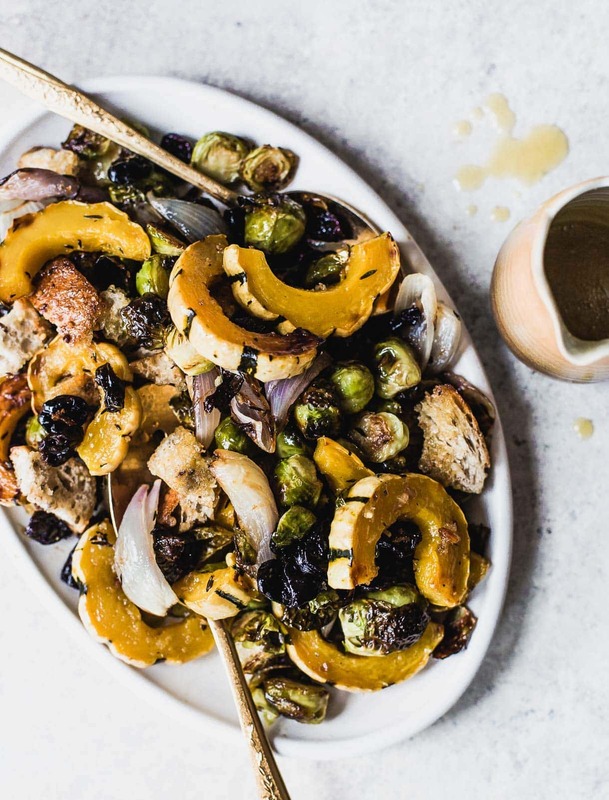 I adore the cherries in this savory stuffing. Ohh I love this! I always waver in stuffing every year, it seems like something that I don’t love, but is always necessary. I think I’m going to have to get into this one this year! Cherries are the perfect addition to any stuffing. That bit of sweetness with the savory is on point. yes, that’s exactly what i was thinking! I love that the bulk of stuffing is actually vegetables. I love stuffing but often find myself eating too much if I’m being honest. Also, double props for the single sheet pan technique! 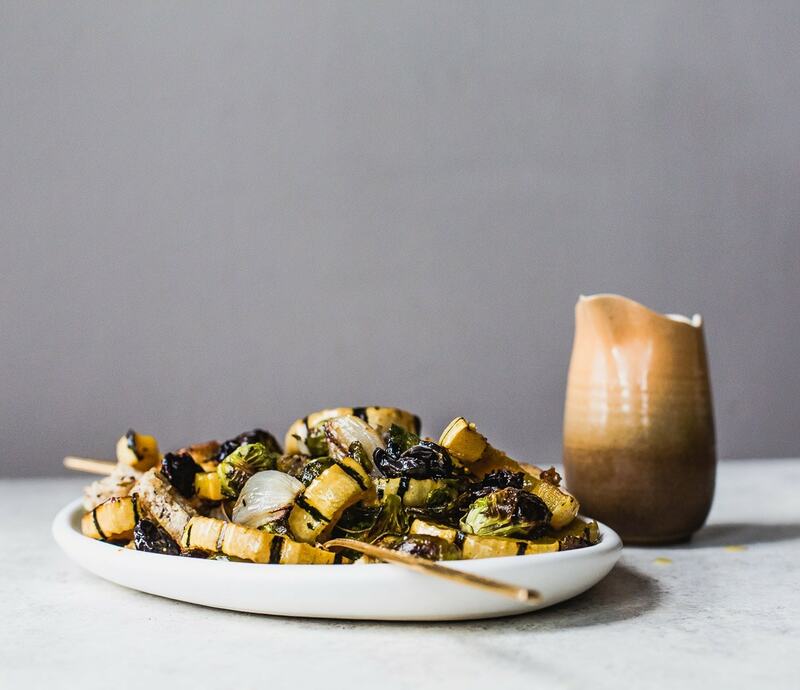 With delicata squash and Brussels it’s truly a win in my book! Vegetables FTW! They’re my favorite part of this recipe, along with the pop of sweet from the cherries. And anytime I can do fewer dishes, I’m sold. :) Thanks for reading, xo. Sounds like a wonderful anytime dish if you skip the bread and serve over couscous. I’ve been looking for a sprout dish, and I’ve just recently dicovrred delicatos. serving it over couscous is a great idea!